Prelude: OregonPhotos strives to be an educational resource promoting knowledge about, and appreciation of, the wilder, more remote natural areas of Oregon...However, on occasion, as owner of OregonPhotos, I feel the need to make a statement that some might view as political or environmental. And in reference to the bubbling brew of big-time development that is sneaking up on Mt. Hood, well, I just have to stand up and speak. The planned resort development will (would have affected) affect Cloud Cap Inn/Cooper Spur Inn/Cooper Spur Ski Area/ Mountain Shadow Estates/ Parkdale/ the Upper Hood River Valley--- in fact, the entire county of Hood River will be impacted. There are (were) major plans well underway between Mt. 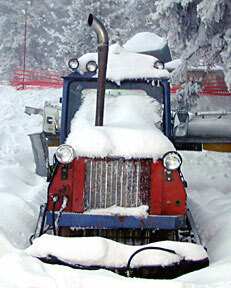 Hood Meadows Ski Corporation, Hood River County, and probably other monied interests, for the decimation of Mt. Hood's "quiet side" by a major destination resort. Make no doubt about it, multi-million dollar land exchanges have already occurred, Cooper Spur Ski Area has already been bought up, etc. This resort complex is going to happen as planned unless---- well, unless concerned people with other values work very hard to preserve the more primitive character of this portion of Mt. Hood. Although I live in the Portland area, my perspective at OregonPhotos is always Oregon, the State taken as a whole, and in this perspective Mt. 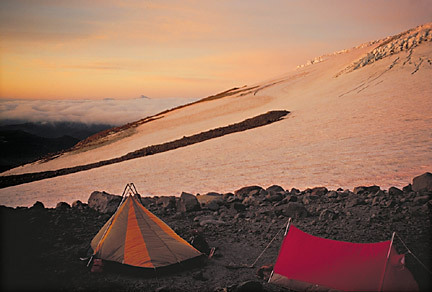 Hood is not just Portland's private playground, rather it reigns in a unique status as Oregon's highest and most glaciated mountain (11 active glaciers, a dormant volcano, still with smoking sulpher hot areas on the upper mountain, and host of small earthquakes in its vicinity every year). A treasure for all the residents of the State. Wy'East is the peak's Indian name, rich in lore, but always in Hood's history there has been a dichotomy between, on the one hand, the clear perception that Hood is a treasure deserving major protection, eg. National Park status such as the Seattle area's Mt. Rainier enjoys, and the other hand, the clear reality that this is a DEVELOPED mountain---even since the 1890s hotels and lodges have been creeping up the mountain all the way to timberline at 6000 feet and above.. Heck, if the Great Depression had not intervened in development schemes of the 20's, there would be a gigantic aerial tram running up the NE side of Hood, all the way to the summit, and the current small US Forest Service Wilderness Area might never have been established. In a bad dream I see into fifty years from now: the Mt. Hood Wilderness has become like Portland's famous Forest Park. Yes, you can hike a long way, and see lots of trees, but, no, there isn't any real wildlife, and, you'd have to be nearly deaf not to hear the constant roar of urban Portland behind every tree. Development in the next 50 years will threaten to overwhelm the tiny Mt. Hood wilderness, driving out the wildnerness values that remain on Oregon's highest peak. Too Bad. The Mountain's NE side, the target of major well-planned and well-financed development, is also unfortunately quite unique-it is very unlike the west or NW sides, being higher, much drier, and historically the seat and center of a tradition of technical climbers, low-budget skiers and backcountry enthusiasts. There is only one significant access road to this zone (FS road S12), and its nature will be terribly altered if the developers succeed. In 2003, you can still drive up the mountain and experience a pleasant and gradual transition into wildness and the mountain's timberline delights at road's end at 6,000 feet.... But after development of the new Resort, your journey will become like driving a gauntlet through crowded city highways, then winding through the eliteness of a place like Sunriver, finally to reach a brief transition of a few miles of gravel road spewing you out to what little is left of Mt. Hood's "wilderness." 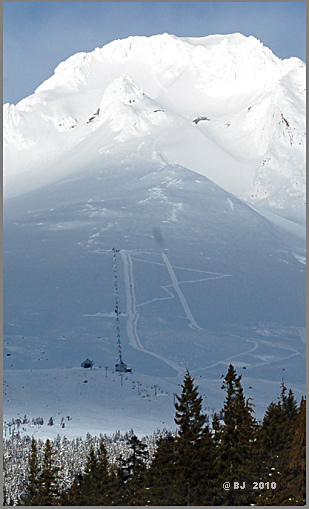 Here is an example of the class of NE-side attractions which will be lost: Cooper Spur Ski Area. Already it has been sold, its fate is probably sealed, but here is a Requiem to "old-fashioned family skiing." Can you believe all day lift tickets were only $9 just a couple years ago? And you could buy into two days of skiing with full lessons for about $35. The cozy day lodge and the Area's one page, non-glossy brochure blatantly billed the Area as "family" and "low cost." This was a place unlike any other still in existence on Mt. Hood, an unpretentious place welcoming to mountain visitors with kids, old-fashioned gear, and slim wallets. My family and I last skied there in December of 2001; we sledded a bit, then we rode the rope tow, and finally put on our climbing skins on our cross-country skiis and walked up the edge of the ski slopes up toward the top of the T-bar lift. Along the way, we passed an abandoned slope groomer/plow machine which added a mellow, old-timey feel to our exploration. As evening fell, we were beckoned to the lodge for hot chocolate before driving back to the City. .. it is the American Way, it is those with Big Money vs. those with other values. So shall we proceed with the mobbing of the mountain's NE side? 2009 Bill Increases Wilderness Options in the North Oregon Cascades! Let's go through a list of Oregon Wilderness areas now surrounding Mt. Hood. From north to south, we begin with the Mark O. Hatfield Wilderness, paralleling the Columbia River Gorge on the Oregon side of the River. Then there is the Salmon-Huckleberry Wildeness, nearly adjoining the Mt. Hood Wilderness on its southwestern side. Just to the south of Mt. Hood lies the small (2870 acres) but much-needed Lower White River Wilderness. Just to the east of the peak and across the deep valley of the Hood River rises one of my personal favorite areas, the Badger Creek Wilderness, topped by 6500 foot Lookout Mountain. Further to the south and west of Mt. Hood lie others: the Roaring River Wilderness, the Opal Creek Wilderness, the Clackamas Wilderness, the Bull of the Woods Wilderness, and the Table Rock Wilderness (a BLM wilderness, another of my personal favorites, click this link).....And of course we cannot neglect to mention the mighty Mount Jefferson Wilderness because it contains the supremely prominent peak that the streams of visitors to Mount Hood constantly see in the distance (click for my pages on Mt. Jeff).